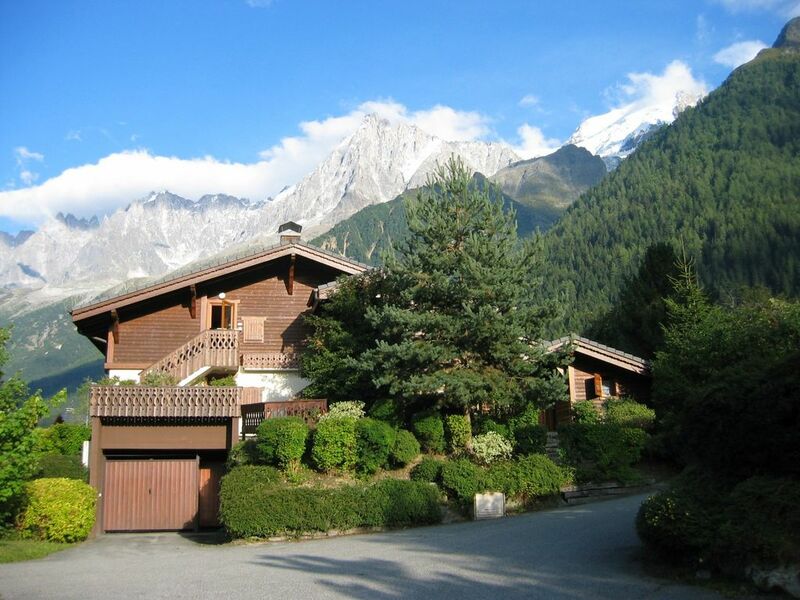 Delightful chalet beneath Mt Blanc, all year, self-catering. Traditional wooden chalet attached to a larger one in peaceful location. Fantastic views of Mt. Blanc range from the chalet. Excellent skiing in Chamonix valley (all levels), speed-riding, climbing, hiking, swimming, tennis, canoeing, and para/hang gliding. Easy access from Geneva airport (motorway or train, also door to door transfers from airport to chalet, using Cham Express or hire car). Close proximity to Swiss and Italian borders (10 minutes from Mt. Blanc tunnel) and 10 minutes from Chamonix. - 1 double bedroom with en-suite toilet & washbasin. - 1 bedroom with bunk beds for 2. - Shower room with toilet and washbasin. - Living room with a sitting area containing two double futons, a flat-screen HD TV with USB/HDMI connections and DVD player. - Dining area for six with a fitted kitchen, sink, fridge, dishwasher, washing machine, wall mounted oven and electric hobs. - Bed linen, towels, electricity and cleaning are included in the rental price. - High chairs and cots are available on request. - A garage and ski cellar are available on request. The accommodation and local amenities: situated in a peaceful alpine setting, the chalet sleeps up to six. French windows open onto a small garden with mountain views. Within walking distance of the nearest supermarket, Les Houches village and bus connections. Les Houches has restaurants, a cinema, spas, a bakery, tourist information and shops. Head to Chamonix for night life where there is also a casino. Winter activities: Ski the famous Vallee Blanche or any of the 13 areas covered by one ski pass all within half an hours drive. Covered skating rink in Chamonix open all year. Open air ice rink in Les Houches open until snow melts in village. Cross country ski routes. Ski hire available in Les Houches. Summer activities: Swim in an Olympic size open air pool in Chamonix facing the Mt. Blanc or join multi coloured para gliders in the sky! Mountain biking, horse riding, golf, white water rafting, summer sledging, canyoning and rock climbing. Endless walks in the local mountains. My name is Jacky and I share ownership of the property with my son Alex, a busy anaesthetist in Oxfordshire. We have spent regular holidays here for many years and still do.I no longer ski but visit in the summer but my son and family ski when they can. Well, we love it! We have had some lovely Christmases here, with fabulous skiing and lovely summer holidays (my son, when young, would spend the entire day at times in the Olympic size swimming pool in Chamonix). My French Father was a Chasseur Alpin in the 30ties and returned to the area when widowed thus introducing us to the Alps and leading to ownership of the property. Our very friendly agents, Chris and Fraser from" Apex Management and Concierge" in Chamonix. They will meet and greet you and be available for anything you may require. 2 futons and television with USB port so you can look at your digital photos! DVD player. Kitchen area, dining area and living area are open plan. Small decking area with grass and amazing mountain view. Skiing in Les Houches, Chamonix, Argentiere and Le Tour. 'Twin bedroom' is a small room with bunk beds plus built-in cupboard. Double bedroom with en-suite toilet. If the property is left in an unsatisfactory state, additional cleaning will be charged for at 25 Euros per hour. The mezzanine is a storage area for the owners use only, accessed by ladder which if used is entirely at the tenants own risk. We will not accept liability in case of injury. This small chalet in a quiet cul-de-sac comes well recommended, we've stayed here for two weeks every year for several years. Clean, well equipped and maintained, a 5 minute drive from the Les Houches lifts and 15 minutes from Chamonix. The new management company as of this year (Apex) is run by two friendly Scots (Chris and Fraser) and we had no issues with our stay. The chalet is located in a perfect spot; quiet, beautiful and close to stores, restaurants, and trailheads. We spent 4 weeks on a climbing/hiking trip and it was always nice to come back and grab a beer or glass of wine and sit out in the garden and enjoy the evening after an excursion. We also liked the fact we could visit Chamonix or elsewhere on a rest day or when it was too rainy to climb and it was only a 5 minute drive. Most of the time there were 4 of us in the chalet which was ideal. It felt a little small when for a brief time we had 5 people. Jacky and Alex were very pleasant and courteous to deal with via e-mail. Great location, great place to stay. The chalet was great, and comfortably accommodated our family of 5, including teenagers. Tucked away in a quiet cul-de-sac, there are lovely views up to Mt Blanc, and a sunny back garden for a well deserved evening beer. It is a good starting point for mountain walks, either from the door, or a short drive away (several spectacular walks within 10 minutes). We liked the Bossons chairlift, (about 25 Euros for a family return ticket) which drops you at the foot of the glacier for a choice of walks up the mountain. A really good holiday. In Summer, the Parc de Merlet nature reserve is not to be missed. It has the best views of the Mont Blanc from its balcony restaurant and there are opportunities to see a lot of alpine wildlife. Also not to be missed: Taking the funicular railway to the Mer de Glace glacier and the cable car up the Aiguille du Midi, a mountain standing almost 4000m high with breathtaking views.